Cancer survivor Rich Little (R) building a woodland trail with other teachers and volunteers. Rich Little is now living an amazing life – his passion for teaching and community-building led him on a journey from his family homestead in Oregon to bush schools in Alaska. After retiring from the State of Alaska in 2003, he returned to continue his work as a teacher and administrator in the town where he grew up, and where his parents and grandparents had served as educators. However, in 2014, problems with fatigue led to tests that resulted in a serious diagnosis: Rich was suffering from a bone marrow disorder called myelodysplastic syndrome, in which immature blood cells never develop fully. Doctors treated him for a time with weekly blood transfusions, then as his condition worsened, chemotherapy was added. As his health continued to decline, Rich’s case was evaluated by the OSHU Knight Cancer Institute in Portland, Ore., which recommended a bone marrow or peripheral blood stem cell transplant if a matching donor could be found. “In less than three weeks they called and told me a perfect match had been found,” said Rich. “I felt there was a mistake. How could someone be identified as a perfect match in such a short time? I was certain that somehow, a donor would have to be a relative, but I had no living relatives who could help.” In fact, due to the way the tissue types that determine matches are inherited, only 30 percent of donors are related to recipients. Seventy percent of donors are unrelated, although they often share ethnicity or have a similar ancestry. Once Rich’s match was found, his transplant was scheduled to happen quickly, leaving him only a short time to arrange for caretakers during his recovery. Transplant recipients undergo a conditioning regimen that not only destroys the diseased cells, but the entire immune system. Only then can the new blood stem cells take hold and create a new immune system free of the illness. This process is called engraftment. During this time Rich needed constant support for several weeks. He is an important part of his community, and that community – from friends to former students to fellow teachers – stepped up to help him when he needed them. 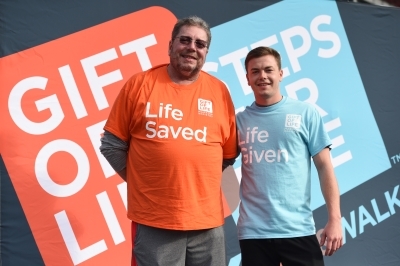 In January 2017, Gift of Life arranged for Rich to meet the stem cell donor who had been a perfect match and saved his life, Ethan Krafft. At the Steps for Life 5k of South Florida, the two were introduced for the first time. “I feel almost as if I’ve known him my whole life,” Rich said after meeting Ethan. “If it wasn’t for him, I wouldn’t be alive now.” Their emotional meeting confirmed the value of Gift of Life’s mission: to find a matching donor for every person who needs one, whenever it is needed. To read the story of their meeting, click here, and to watch a video about their introduction, click here. Rich took extensive notes about his transplant experience, and hopes his practical knowledge may be helpful to other patients who are preparing for a bone marrow or stem cell transplant. “I would like to help others who are navigating through the process, for example, using social media to organize their caregivers,” he said. 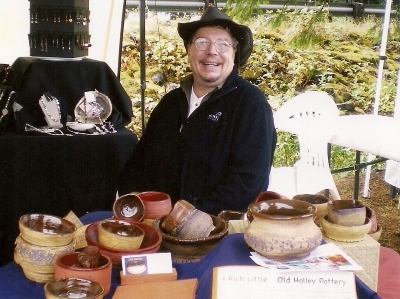 Rich is now expanding his ceramics studio with a classroom, where he plans to teach classes to the many who have asked him to share his knowledge. His goal is to create a place where arts and social interaction create a comfortable space for all.